To celebrate 60 years in the Billings community, the Billings Symphony hosted virtuoso violinist Jennifer Frautschi for opening night. With delicate grace and charm, Frautschi performed Tchaikovsky’s Violin Concerto in D major. 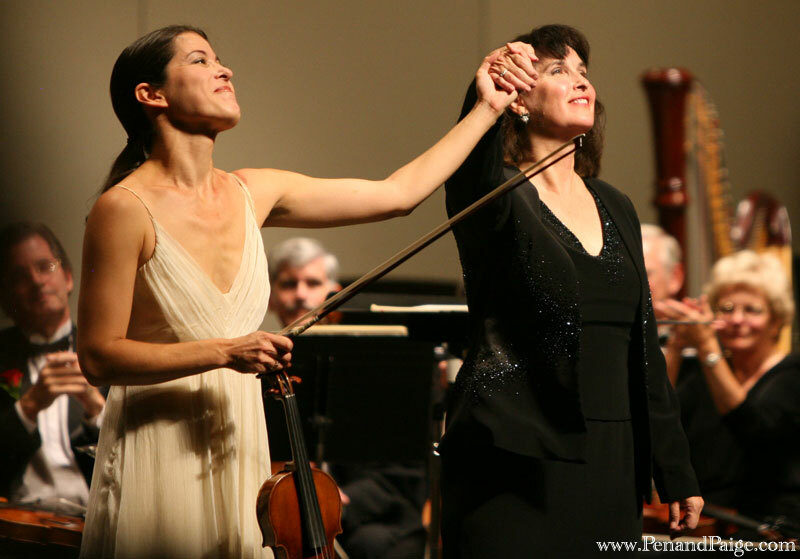 Harrigan’s banter with the audience and the celebration of symphony founding, former and present members, created a comfortable, hometown feel to the evening. 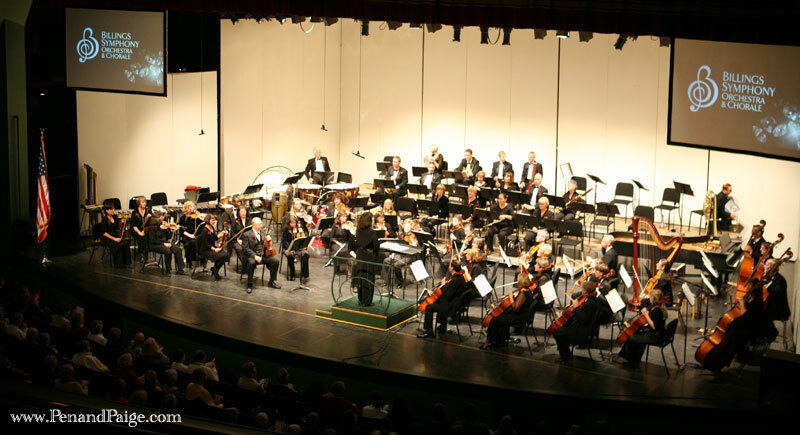 The Billings Symphony Orchestra in performance on opening night of its 60th season, Sept. 18, 2010. The orchestra began with Allegretto from Karl Jenkin’s Palladio Suite, recognizable to many because of the snippets featured in a diamond commercial. The light piece featured the stringed sections, and after bringing back onto stage the wind instruments, Harrigan welcomed Frautschi. From the first stroke of bow to 18th century Antonio Stradivarius violin, Frautschi awed with her pure tone. At times the drawing of the bow against strings was so delicate one was afraid to breath for fear of disturbing the silence in the hall. Other moments were filled with what seemed song, high-pitched singing and delicate murmuring emitting from the instrument. Born in Pasadena, Calif., Frautschi began violin at the age of three. Well-educated, she attended Harvard, the New England Conservatory of Music, and The Julliard School. 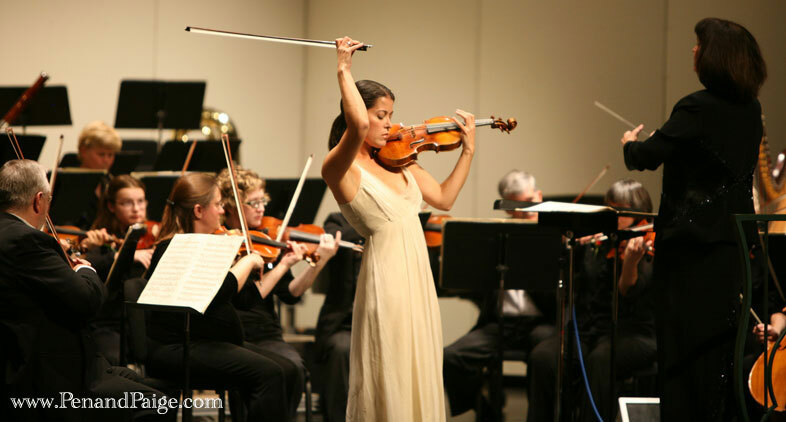 Violinist Jennifer Frautschi in performance with the Billings Symphony during opening night Sept. 18. Subtle and charming, and wearing a free-flowing white dress grazing the tops of her silver heels, Frautschi appeared restrained onstage. Her presence matched the music—light, classy and delicate yet moving into a nimble, mischievous, and, at times, aggressive tone. From the melancholy allegro moderato to the impassioned finale, the Allegro vivacissimo, Frautschi fluttered, bowed, and plucked her way up and down the chromatic, charismatically performing one of the most technically demanding concertos of the classical repertoire. Billings Symphony members have a bit of fun with the music of Leonard Bernstein, leaping from their seats to perform a bit of the Mambo. BSO’s next performance, themed “Musique Macabre,” takes place Oct. 16. The orchestra will perform performs Wagner’s Ride of the Valkyries, Grieg’s Hall of the Mountain King, Saint-Saëns’ Dance Macabre, Mussorgsky’s Night on Bald Mountain and Berlioz’s “March” and “Finale” from Symphony Fantastique, as well as selections from the animated movie “The Corpse Bride.” Attendees are encouraged to dress for the occasion.